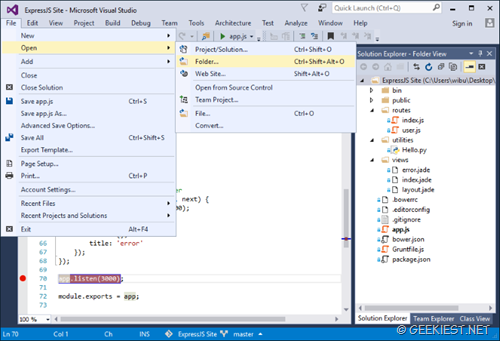 Microsoft released a preview version of the latest Microsoft Visual Studio 15. Do not confuse it with the Microsoft Visual Studio 2015. Remember this an unsupported prerelease version of Visual Studio. using it in a production environment is not at all advised. The most prominent thing you’ll notice when you go to install this release is that there are two ways to install. With Visual Studio “15”, we are previewing a new lightweight installer that focuses on making installation much faster and less impactful. The smallest installation of Visual Studio with the new installer downloads in less than 300MB, and includes basic code editing support for over 20 languages along with debugging and source code control. You can optionally add support for other features: .NET desktop development with WPF and WinForms, Python, C++ and Unity. It’s a great way to preview new features in the next version of Visual Studio without impacting your production development work.